The University has an obligation to provide a safe environment for learning and to protect the security of students while on University property. In turn, students have a responsibility to avoid disrupting or jeopardizing this safe learning environment. For more details on university policies that outline these rights and responsibilities, click below. The Charter of Students’ Rights states that the University has an obligation “to maintain safe and suitable conditions of learning and study” and “to ensure that adequate measures are taken to protect the security of students on University property” (Articles 7 and 8, Charter of Students’ Rights, Policies on Student Rights and Responsibilities, on the Secretariat website). In emergency situations (i.e., when a student’s health or well-being is at risk), the Dean of Students is the main contact with all third parties, including families. Click on the tab that best describes your situation to find other support and contact information. If a student or others are in immediate danger, contact 911 from any campus telephone; Security Services will automatically monitor the call. If you use a cell phone, please follow-up by advising Security Services that you have called 911 (Downtown: 514-398-3000; Macdonald Campus: 514-398-7777). To request intervention for behaviour that is disturbing and is creating a threatening or uncomfortable situation, contact Security Services (Downtown: 514-398-3000; Macdonald Campus: 514-398-7777). An agent will come to the location to assess the situation and possibly accompany the student to another location. Procedures are in place for investigation, support and follow-up. If a student is being disruptive but is not in crisis, contact the Disciplinary Officer in your Faculty, Athletics, Residences, or the Library. If you are unsure of what constitutes disruptive behaviour, review the limits to behaviour outlined in the Code of Student Conduct and Disciplinary Procedures on the Secretariat website. Articles 21(a, b), 54.1(d), 68.1(f), 78.1(f) in the Code of Student Conduct empower a Disciplinary Officer to exclude a student from campus or a residence, with or without a disciplinary interview, while the matter is being investigated or the situation remedied. Instructors have the power to exclude a student from the remainder of a class and the following class (Article 21(c)). To request investigation of behaviour that, while not immediately a safety concern, is disturbing, uncharacteristic or undermining the well-being of others, contact the Case Manager in the Office of the Dean of Students (casemanager [at] mcgill.ca; 514-398-1881 or 514-398-4990). Procedures are in place for investigation, support and follow-up. To learn more about the Case Management process, click here. The Office of the Dean of Students upholds Quebec privacy legislation, which does not permit any information about a student to be released to any third party, including a member of a student’s family, without the student’s prior written consent. Emergencies give rise to exceptions under the provincial law and an emergency is defined as a situation in which a student’s health or well-being is seriously at risk. Mandate: To alert, share and consolidate information about students of concern with the ISST members. 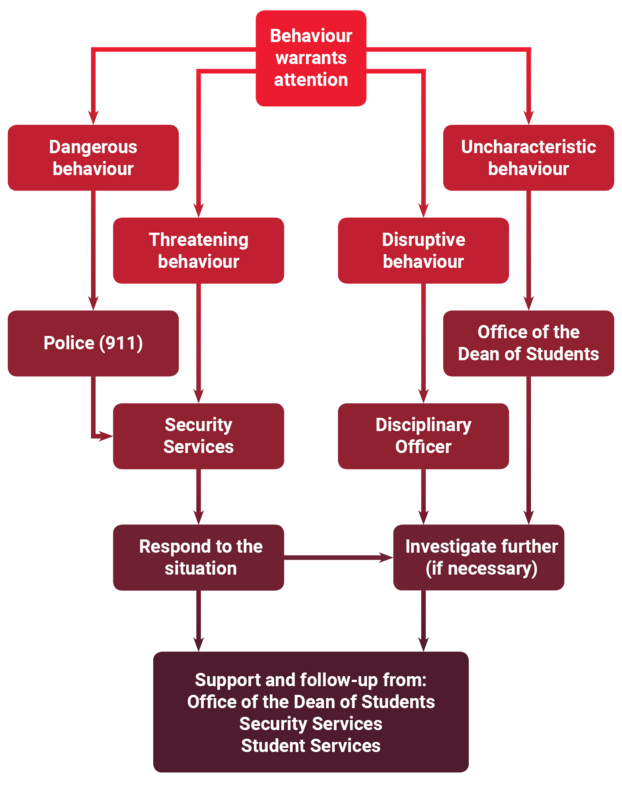 To assess reports of concerning, problematic, disruptive behavior, or high risk situation involving a McGill student. The ISST will consult with, and collaborate with, McGill Faculties, Departments, University Offices and Services, i.e. Legal Services,when necessary. The ISST will implement intervention that is in the best interest for the safety and well-being of students and the McGill community, and coordinate the support needed. Student names will be shared only on a need-to-know basis. Confidential records of student names and notes regarding each report will be kept with the Office of the Dean of Students, as some cases may go on for longer than an academic year. Tracking and follow-up is required. Meetings: The ISST will have regular half-hour weekly meetings during each Fall and Winter semester. ISST members can alert and call for an additional meeting as required.